The Keck laser guide star (LGS) adaptive optics (AO) systems are available for science with NIRC2 and NIRSPAO on Keck II and with OSIRIS on Keck I.
Keck LGSAO Science Publications refereed or all papers. Please follow the links below to learn more about laser guide star adaptive optics, the design and performance of the Keck system, and planning science observations. Wizinowich, P., 2013, PASP, 125, 798. Wizinowich, P., et al. 2006, PASP, 118, 297. M.A. van Dam et al. 2006, PASP, 118, 310. M.A. van Dam et al. 2007, KAON 489. 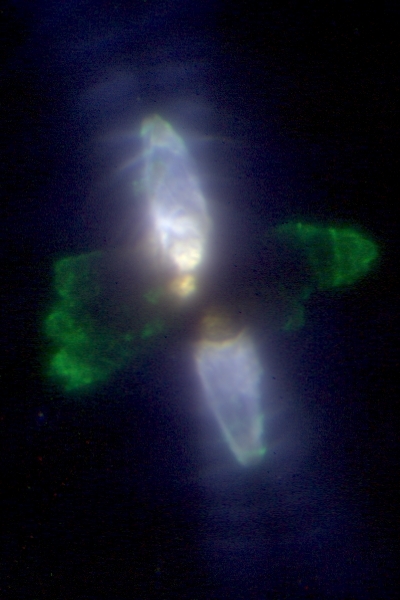 The Egg Nebula imaged on NIRC2 in H, H2 (2.12) and Kcont (2.29) bands on 07 Jul. 2004 UT - FOV: 15.8"x23.7"